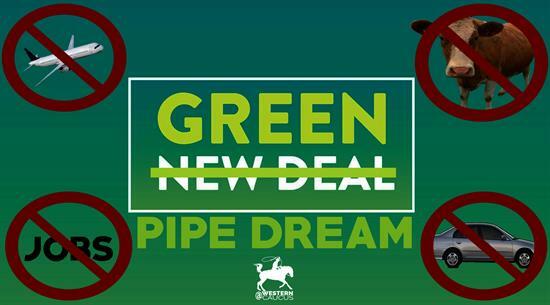 WASHINGTON, D.C. - Today, members of the Western Caucus released statements denouncing the unveiling of the Green New Deal by Rep. Alexandria Ocasio-Cortez (NY-14) and Senator Ed Markey (MA). Rep. Kelly Armstrong (ND-At Large): "The Green New Deal is a raw deal for North Dakota and all of America. It’s a ridiculous proposal from beginning to end – from upgrading or replacing every building in the country to eliminating gas engines. North Dakota grows the world’s food and produces the world’s energy, providing good-paying jobs and an honorable way of life to tens of thousands of Americans. This proposal would end North Dakota’s economy as we know it." Today, the framework of the Green New Deal was unveiled at a press conference with Rep. Ocasio-Cortez (NY-14), Senator Markey (MA) and a few of their colleagues. Click here to watch the press conference. Click here to read "an updated version" of the Green New Deal FAQs Rep. Ocasio-Cortez's office provided to NPR. Click here to read the text of the bill, H.Res.109, containing the new Green Deal framework that Rep. Ocasio-Cortez introduced. Current cosponsors of the bill can be found here. A screenshot of the blog post with Green New Deal FAQ’s posted on Rep. Ocasio-Cortez's website that has gone missing can be viewed here.